MSNBC host Krystal Ball was on the receiving end of a bad prank call during a television coverage of the downed Malaysia Airlines plane on Thursday. 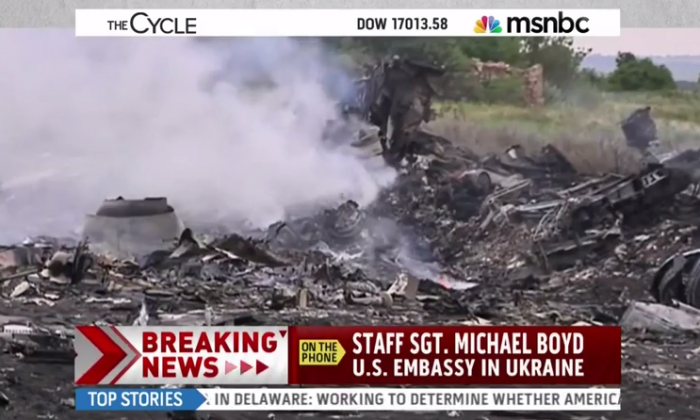 During MSNBC’s The Cycle spot on the ill-fated Malaysia Airlines MH17 crash, a prank caller going by the name of “Staff Sgt. Michael Boyd.” gave his opinion of what he supposedly saw from the crash site. “Well, I was looking out the window and I saw a projectile flying through the sky, and it would appear that the plane was shot down by a blast of wind from Howard Stern’s [expletive],” the caller said. Ball continued to ask Boyd for more details given his “military training ,” following which the caller crudely mocked the host before hanging up. Here is an Associated Press story about the plane crash. WASHINGTON (AP) — American intelligence authorities believe a surface-to-air missile took down a passenger jet in eastern Ukraine on Thursday, a U.S. official said, but the Obama administration was still scrambling to confirm who launched the strike and whether there were American citizens killed in the crash.